Los Angeles trailed 2-1 in the third period when Roy tied it at 9:28 with a shot from the blue line for his first goal. The Kings defenceman, who entered with two assists in 15 career games, initially thought Brown might have tipped the shot in and had a delayed celebration. 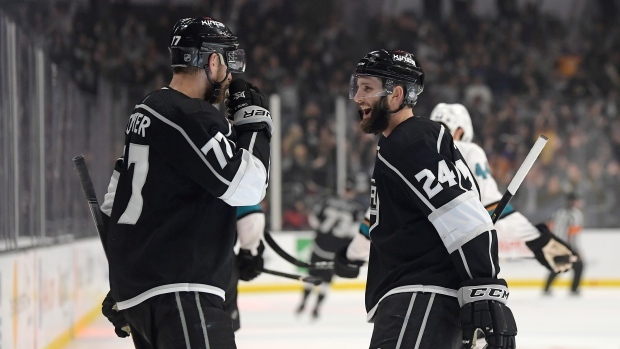 There was no such hesitation from the Kings to take the 3-2 lead as Kopitar got in behind the Sharks defence at 11:45 of the third period, getting his 21st goal. The Sharks lost track of the Kings captain as both teams fought to take the puck off the wall in the San Jose zone, with Alex Iafallo eventually chipping over to Kopitar for a breakaway. San Jose looked to be in good shape to stay within striking distance of Calgary even without forwards Logan Couture and Joe Pavelski and defenceman Erik Karlsson in the lineup when Hertl scored his 32nd goal on a wrist shot from the right circle for a 2-1 lead at 3:45 of the second period. NOTES: Brent Burns had an assist for the third straight game. It was his 76th point of the season to tie his career high and Sharks record for points in a season by a defenceman, which Burns set in 2016-17. ... Kings F Brendan Leipsic missed the third period after sustaining a lower-body injury. ... Pavelski skated during an optional practice Thursday but did not take contact. ... Iafallo had two assists.